Last Friday, I joined a protest against David Icke in Watford. 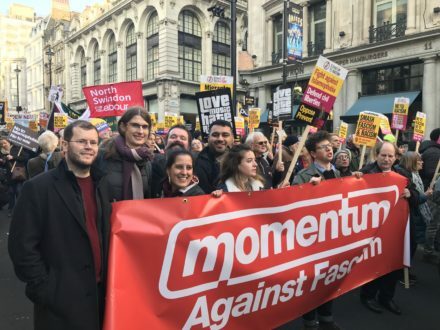 It was called by a new Labour grouping called Socialists Against Antisemitism, and supported by groups including Momentum and the Jewish Labour Movement. The picket was productive, with at least a few Icke fans dissuaded from attending thanks to our arguments. Icke remains an influential presence in online conspiracy theory culture and, as with the US far-right conspiracist Alex Jones, there is a pernicious side to his theories. These sinister elements are sometimes disguised by the more eccentric aspects of his worldview. It could be argued that the most bizarre elements of Icke’s thought (the world being secretly ruled by “lizards”, for instance) are actually carefully constructed metaphors. These metaphors then serve as a cover of ‘plausible deniability’, which he uses to shield himself from accusations of antisemitism. It is without doubt that one of the main conspiracy theories that Icke promotes is the antisemitic theory about Jewish control of the world. As this Momentum video shows, Icke often lists Jew after Jew whom he believes is part of an all-encompassing conspiracy. He designates these individuals as “Rothschild-Zionists” – a very thin disguise for his blatant antisemitism. Endorsing the notorious (and fake) Protocols of the Elders of Zion as authentic, Icke regularly promotes Holocaust denial materials written by other authors. That’s not to mention his overt transphobia and belief that migration and “race mixing” are tools of the “globalists” to weaken people’s resolve to resist the elite. Icke may not have the same contemporary influence as Tommy Robinson, or the political power of Boris Johnson or Theresa May, but that doesn’t mean we shouldn’t oppose him just the same. We can, as anti-racists, campaign against all forms of racism simultaneously. Icke is highly popular amongst the far-right and his work is regularly cited by neo-Nazis. But there is a further troubling aspect to his appeal: it is through Icke, and conspiracy theory culture more generally, that antisemitism has seeped into some parts of the left. This conspiratorial thinking is most prevalent amongst some sections of the non-Labour Party, non-Marxist, “cyber-hacker” online “left”. However, there have also been publicised cases of Labour antisemitism from local activists and councillors, quoting “Rothschild” and similar conspiracy theories. Even a small number of such cases are unacceptable. Those individuals must be called out and rooted out wherever we find them. They sully the good name of the left, and stand in absolute opposition to the long history of fighting anti-semitism that the left is rightly proud of. The conspiracy theories propagated by Icke and his acolytes can be found in particular in often unmoderated, or open, online communities. For example, the Facebook page “Britain is the People” has over 100,000 fans and gets considerable engagement, with various pro-Labour and anti-Tory memes. However, as the main pro-Corbyn page “Jeremy Corbyn for PM” exposed recently, the “Britain is the People” page also promotes insidious antisemitism about “Rothschilds” and “Zionists” controlling the world. It’s disappointing how many people fail to recognise that these theories are antisemitic – all too often people defensively insist that, even if they disagree with them, they can’t be antisemitic because the word “Jew” isn’t used. An alarming number of people have responded to Momentum’s video and support for the protest by defending Icke and his antisemitic theories. Several even said they would cancel their membership of Momentum, accusing it of having joined the “Zionist conspiracy”. This, if nothing else, is vindication of the protest. Any backlash has only underlined the need to actively oppose this conspiracy culture and educate people where we can about how harmful it is. Indeed, following the Momentum protest last Friday, David Icke himself has launched an attack against Momentum (and against one of its founders Jon Lansman) using every antisemitic trope in the book. Ultimately, conspiracy theory is a popular way of thinking across society and across the political spectrum. It also permeates the worldviews of many troubled individuals suffering from mental distress, including illnesses characterised by paranoia. David Icke’s writings mislead and terrify countless vulnerable people. Conspiracy theories offer an easy way to understand and explain the world. But not all conspiracies are as harmless as others. If an ordinary member of Labour, the Conservatives, or any other group, thinks that JFK was killed by the CIA, it probably doesn’t matter that much. And not all accusations of conspiracy are false – plenty of real conspiracies have taken place throughout history. If somebody thinks that “Rothschild-Zionists” control the world, on the other hand, it matters a great deal. It is a dangerous and false distortion of reality. This is one of the ideas that has justified atrocious antisemitic violence and persecution, from the Holocaust to, most recently, Robert Bowers’ attack on a synagogue in Pittsburgh, the worst act of antisemitic violence in American history. This should serve to remind us all of the need to oppose these ideas wherever we see them. We cannot allow ideologies rooted in far-right thinking and irrational discourse to take hold within even a small part of the left. The Labour movement has a lot to do right now, from fighting May’s dodgy Brexit deal to challenging Tommy Robinson and the new far right. But anti-racism can’t be conditional. It doesn’t take much effort to call out this dangerous nonsense when we see it, and as anti-racists, it really is our obligation. Dr Yannis Gourtsoyannis is a Momentum activist.